At present, B-SAT controls five satellites, namely BSAT-1a and -1b, BSAT-2a and - 2c, and BS-3N. We have successfully set up of one control center to control three satellites or more within a range of plus to minus 0.1 degree longitude from the center. Besides B-SAT, this practical application is limited to SES Astra and Eutelsat in Europe. Because we have operated those special satellites and satellite broadcasting plays an important role in all broadcast media, we have been trying to take all possible measures for stable satellite operation." 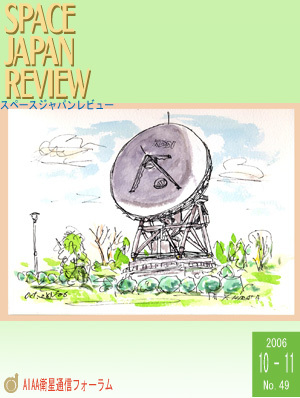 President K. Nagai, B-SAT, talks future trends of broadcasting satellites. As a result, I learned and obtained through the loss of SUPERBIRD-A(original) that the �gordinary�h work cannot be done easily, and that, therefore, it is worth being enthusiastic in achieving ordinary work. At the same time, I felt that I, who experienced this accident should not come out from the on-site operation job. These lessons learned became the starting point of my work." Mr.Shigetaka Shinozuka, General Manager of the Space Communications Corporation, who has taken charge of the operation of communication satellites for more than 20 years, talks the hardship of the satellite launch failure, the experience in the United States, and the future of the satellite business. Although physically preventing the seismic hazard is difficult, the disaster will be held off due to at least minimum damage by accurate information transmission. Especially, an accurate, prompt information transmission of the initial-stage disaster is extremely important for disaster prevention and the disaster mitigation. As for the research of the earthquake prediction, even the prospect of the earthquake that is in several days even if advancing is difficult. If the attainment time and the seismic intensity can be informed by detecting the preliminary tremor of the earthquake in a place near the epicenter before a few seconds when the earthquake reaches, it comes to be able to take measures between those even a little. Thinking what you can do between those will give birth to the following innovation. It is possible to have time from a later tidal wave from the earthquake wave.. running away a little more.. The service introduces here will come to used more than the offer of the backup telecommunication line at the disaster in the future.